Every week, tune in for a full hour of award-winning outdoor perspective on the news valued by hunters, anglers, and outdoor enthusiasts across the greater Minnesota region. Hear special guests discussing topics ranging from managing Minnesota’s deer herd, to angling tips and news from experts including “Tackle” Terry Tuma. Listeners across the Greater Minnesota Region can tune into the Outdoor News Radio weekly talk show hosted by Rob Drieslein on these stations. 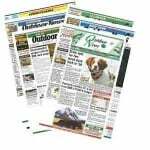 Are you interested in advertising on Outdoor News Radio? Click here. Pelicans are back in Minnesota – and in more ways than one. Another silver carp is captured in the St. Croix River. What does this mean for that resource? What's a balanced rig? According to one hall-of-fame angler, you'll need it when you get into the early-season crappies. Calling turkeys when it's windy can be a challenge. Here's what to do. What you need to know about permits for the upcoming bear hunting season. High expectations for salmon and trout fishing on Lake Superior. Here's why it could be epic. So what's all happening in the great outdoors, in Minnesota and beyond? Join Outdoor News Managing Editor Rob Drieslein and guests again this week to find out. Fishing protocol: It's all about the details. Here's what you need to know to help land more – and bigger – fish. Check in with Outdoor News Managing Editor Rob Drieslein and guests as they talk what's hot in the out-of-doors. Targeting late-season panfish? Here's how to catch 'em. With all this snow, what can we expect for fishing openers? Why you should consider a new turkey-hunting blind this season. Check out this week's installment with Outdoor News Managing Editor Rob Drieslein and guests for goings-on of note in the great outdoors. Syrup lovers, ever wonder how to tap your own maple tree? Here's how. Seeing birds through the opera glass. Heavy snow is extending the crappie bite. But what you need to know to find these fish. So what's your favorite caliber of rifle to hunt with? What you need to know about changes to Minnesota's fishing regs. Too much snow, ice and cold to venture outdoors? Well, get your outdoors fix here as Outdoor News Managing Editor Rob Drieslein and guests discuss hot topics in fishing, hunting, conservation and beyond. World's oldest-known wild bird just hatched another chick. Just how old is she? So how is all this snow impacting ice anglers? Hunt pheasant or quail in Iowa? Looks like the upcoming seasons could be a struggle. Here's why. A good year for snowmobiling, but drive sober out there. An epic man-vs.-fish battle accompanies the new Minnesota record for sturgeon. One-stop shopping for what's what in the out-of-doors, care of Outdoor News Managing Editor Rob Drieslein and his in-the-know guests. What's your all-around favorite fish? So how old can a walleye get? Check out the age of the granddaddy of all North Dakota walleyes. Pay attention to detail during a tough walleye bite. New CWD-positive wild deer found outside southeastern Minnesota range where it had only been found before. Drawing down a waterfowl haven in the battle against this invasive. What are the big stories in the out-of-doors? Tune in as Outdoor News Managing Editor Rob Drieslein and guests discuss just that. With all this ice and snow, sometimes you need to bring the fish to you. Here's how. When the bite gets tough, use underwater cameras to modify your approach. This guy knows hunter safety. You should, too. Chronic wasting disease positive detections are up – but so, too, is the number of deer tested. Enjoying an Earth Day celebration. Tips for calling turkeys when the going gets windy. Mr. Walleye knows crappies, too. How he slays the slabs during the wild early-spring bite. How you can still help rare or endangered species in the state. It's time for the state's annual frog and toad survey. For fishing success, it's all in the details. Contemplating getting your boat and trailer ready for open-water fishing? Here's one thing you need to check immediately before you do anything else. There's still time to enter artwork for the 2020 state park sticker design contest. Listen in for the details. Rare plant getting a boost. Here's how. A new blind this turkey-hunting season? Here's what to consider. An unlikely "lure" for those late-season panfish. Thanks to all this snow, the crappie bite is still on. But with all that snow, how do you find these fish? A bird book worth checking out. Hunters, what's your favorite caliber of rifle to hunt with? What you need to know about providing input regarding Wisconsin's natural resources. It's that time of year for meetings and hearings regarding Wisconsin's natural resources. Listen to why you need to be at these gatherings. If you hunt pheasant or quail in Iowa, you'll want to hear about this. Keeping native species from disappearing. It's been a tough winter for wildlife, but for a number of reasons, it might be best to choose habitat over feeding for these critters. Ice anglers, how do you find fish with all this snow? Take a hint from Dave Genz. The oldest-known wild bird just hatched another chick. You'll be amazed at just how old she is. The granddaddy of all North Dakota walleyes. If you had to pick your favorite fish, what would it be? Walleye anglers, what to do when the winter bite gets light. Trail cams to be used in bid to help restore one of Wisconsin's only endangered mammals. It's been a tough winter on whitetails. But should we be feeding those deer? All this snow means you might have to bring the fish to you. The winter bite getting tough? Might be time to modify your approach. A tough winter for the ducks that stick around. So what do you do when, say, you're attacked by a mountain lion in the wild? Check out how this guy survived. So how did fall turkey hunters fare in 2018? Things to do to catch fish when the bite gets tough this hard-water season. Tips that will help you stick a fork – well, make that a spoon – in those wary winter walleyes. Woodpeckers can point to emerald ash borers in the wintertime, telling you if that tree is infested. The southern Wisconsin snow drought is over. What that means for outdoors enthusiasts. Hey, birders, you'll want to keep an eye out for these birds this winter.